This positional change on debt is an Orwellian shift on the grandest scale. 'Four legs good, two legs bad' while in Opposition. 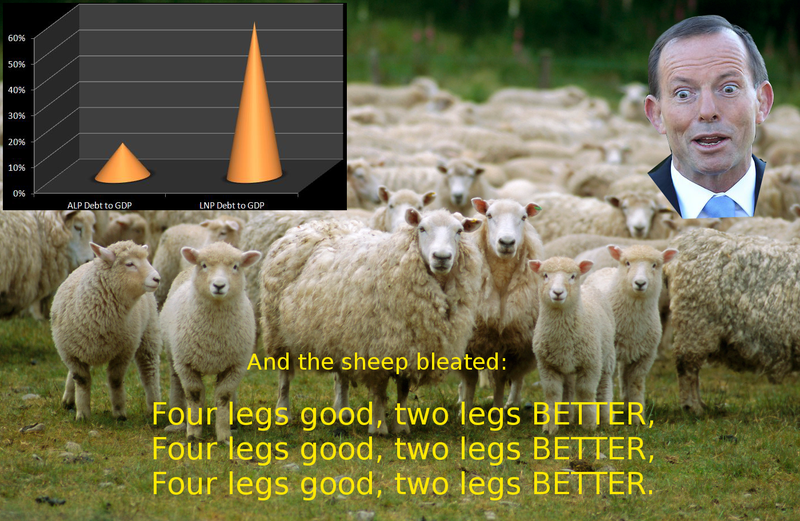 When in power: 'Four legs good, two legs better'. Prime Minister Tony Abbott has been renowned for playing populist politics. In fact, since the Howard years, fear-mongering for popularity has been the hallmark of the federal LNP whenever the polls head south for them. Usually, the fear-mongering revolves around the world's persecuted by trying to claim that victims of war, brutality and terrorism are terrorists. If it's not fear of refugees and Muslims, it's the 'D' words. Debt and Deficit. While in opposition, Abbott acted more as a pugilist than a politician by constantly attacking Labor's economic policies. He successfully managed to convince the majority of Australians that Labor didn't have to stimulate the economy during the GFC. Considering that Australia dodged recession by less than half a percentage point, just what would have happened had Rudd not dropped billions into the economy to protect jobs and businesses? The Abbott approach of economic austerity would have seen Australia go the way of other western nations. There would have been recession and a blowout in the deficit with increased unemployment and business collapse impacting significantly on government expenses and revenue. Abbott and his band of ultra-conservative warriors would screw the economy with austerity and trickle-down economic policies that failed in America and throughout Europe. Austerity increases poverty. Poverty puts a greater burden on the economy through increased government expenditure on support programs for the unemployed and homeless, reduced government revenue through less tax paid by a smaller workforce and less revenue from business as the consumers have less disposable income. When Abbott took power from Labor in September 2013, debt was travelling at an enviable level of around 13% of GDP. Britain's debt to GDP was 111%, USA was 106% and Greece exceeded 170% (1). Yet, Abbott had Australians believing the economy was on the brink of collapse. He rolled out the mantra that we're paying a billion dollars a day in interest. Yet within six months of taking office he doubled the deficit through his so-called 'responsible' economic policies that saw an increase in expenditure to the big-end of town and a decrease in revenue by removing some taxes (2). Abbott declared a budget emergency when he took office. Yet within days of claiming that under Labor the Australian economy faced a 'Greek-style' disaster, Abbott miraculously healed the economy and claimed that the budget emergency was no longer an emergency. Debt to GDP at 13% under Labor was sending Australia over the precipice, if the Chicken Little 'sky is falling' politics of the LNP in Opposition was to be believed. Now at 15%, Abbott claims Australia can handle debt to GDP at 60% (3). This positional change is an Orwellian shift on the grandest scale. 'Four legs good, two legs bad' while in Opposition. When in power: 'Four legs good, two legs better'. All Labor debt bad, all LNP debt good. With such a massive disparity in messages from this government, do Australians really believe anything Abbott says? Australia's economy was the strongest in the western world following the GFC thanks to the Rudd/Swan stimulus packages. Debt needs to be managed through structural reform, such as reducing concessions to the wealthy and improving standards for the less wealthy. However, to effectively manage debt the economy needs stimulus. Saul Eslake of Bank of America Merrill Lynch has stated the economy needs 'short-term fiscal stimulus that's well targeted' (5). It doesn't need austerity. It needs responsibility. The Abbott government is on track for an $80 billion increase in debt over the four years to 2017-18 (6). Much of this is because their socially irresponsible budget in 2014 which slashed funding to education, health and welfare, resulting in many of its big 'savings' (read austerity) measures being blocked in the Senate. His first budget attacked the largest consumer group, namely those at the lower end of the wage spectrum. At the same time, the government gave billions to large multinational companies through subsidies and tax offsets. Abbott tried to use the recently-released inter-generational report to further his economic scare-mongering, yet it predicted the deficit to average less than 1% of GDP for the next decade (7). What does Abbott stand for? What keeps him awake at night? What means most to him? On 20 March 2015, former Prime Minister Malcolm Fraser died. Fraser's great passion, the thing that kept him awake at night, was human rights. He campaigned for the rights of asylum seekers and was heavily critical of the abusive and harmful policies of Labor and Liberal that played on the fears of bigots. Accolades flowed from both sides, praising the old statesman. Tellingly, Abbott's comment was 'He had correctly read the mood of the public' (8). Only a politician who is kept awake at night worrying about the polls and his own power would say something like that. Abbott has no concept of economic management. The economic policies of Abbott and his 'Team Australia' are destroying the living standards of those most vulnerable. He is robbing the poor and giving to the rich, driving up debt and deficit with it. Abbott governs by popularity polls which he attempts to manipulate by coercion and fear. He is not a statesman and will never be held in the same regard as Fraser. 1. The Conversation, Raja Junankar, 'The state of Australia - the economy', 8 May 2014. http://theconversation.com/the-state-of-australia-the-economy-26230. Accessed 20 March 2015. 2. ABC News, 'Fact check: Has the Government doubled the budget deficit? ', 10 June 2014, http://www.abc.net.au/news/2014-05-06/has-the-government-doubled-the-budget-deficit/5423392. Accessed 14 February 2015. 3. The Australian Financial Review, Phillip Coorey and Jacob Greber, 'Abbott loses the plot on debt', 19 March 2015. Accessed 19 March 2015. 4. Orwell, George. Animal Farm. Great Britain: Penguin, 1987. Print. 5. ABC 7.30, Leigh Sales, 'Budget on the mend' says PM, facing headlines claiming he's 'lost the plot', 19 March 2015, http://www.abc.net.au/7.30/content/2015/s4201187.htm. Accessed 20 March 2015. 6. The Australian Financial Review, Laura Tingle and Phillip Coorey, 'Budget gets $80b worse under Libs', 20 March 2015. Accessed 20 March 2015. 7. The Guardian, Stephen Koukalis, 'Ignore the intergenerational report scaremongering - the news is good', 19 March 2015, http://www.theguardian.com/australia-news/2015/mar/19/ignore-the-intergenerational-report-scaremongering-the-news-is-good. Accessed 19 March 2015. 8. The Guardian, Katherine Murphy, 'Malcolm Fraser, former Australian Prime Minister, dies aged 84', 20 March 2015, http://www.theguardian.com/australia-news/2015/mar/20/malcolm-fraser-dies-aged-84. Accessed 21 March 2015. Also refer to: Ranting Panda, 'Australia's manufactured debt crisis', 14 February 2015, http://thepandarant.blogspot.com.au/2015/02/australias-manufactured-debt-crisis.html.